I know last night I told you all that we don't do a big family get-together for Christmas. My family is composed of Davises, Olsens, Burkes, Dorgans, Scruggs, Shannons, and the list goes on. I think we own a monopoly on most of Wisconsin and also have plotted ourselves in Washington DC, Atlanta, Idaho, Arizona and I'm sure tons of other places. See, my family is huge. Huge, HUGE. My dad is one of seven; my mom, one of four. My dad's oldest sister had seven children, most of his other siblings had handfuls of children. I'm one of a million cousins and I'd be lying if I said I could easily name all of them. With that being said, it's easy to come to terms with the fact that with a family so big, it's easy to get lost in the mix. However, one thing that never gets lost is Grandma's cookies. My mom's mother, aka Grandma Olsen, has been sending the same cookies for years. Come early December, we get a giant box on our front step full of the first lot of presents, cards and sweet tins of cookies. Marvelous! The cookies only last about three days before all that's left are a few crumbs on the bottom and maybe a nibble or two that someone (my mom) was saving for later. In honor of all Grandmas out there, I'm going to give you five of the recipes, in one fair swoop, as to not keep you waiting. So without further ado, here goes. 2. Roll dough into bite size balls. Bake in preheated oven for about 15 minutes. Remove from oven and while still warm, roll in powdered sugar. 1. Preheat oven to 350. Mix and sift flour and baking powder. Cream butter well. Add sugar and continue to cream until light and fluffy. Add well-beaten egg and vanilla and mix well. Add sifted dry ingredients gradually mixing just enough to combine. Chill. 2. Mold into small balls, about 1 tbsp of dough each and roll in sugar. 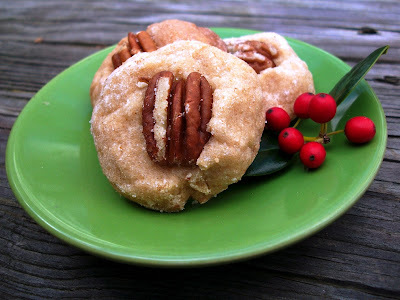 Place on baking sheet and press pecan into the center of each dough ball. Bake in preheated oven for about 15 minutes. 1. In a heavy saucepan over low heat, cook and stir candy coating and chips until melted and smooth. Cool for 10 minutes; stir in peanuts. 2. Drop by rounded tablespoonfuls onto waxed paper-lined baking sheets. Refrigerate until firm, about 45 minutes. Yield: 10 dozen. 1. Preheat oven to 375. Cream butter. Add sugar until well combined. Add egg and beat. 2. Sift flour, cinnamon, baking soda. Add to sugar mixture, blend and chill. Divide into thirds. 3. Cook dates and water until soft in a saucepan. Add sugar. Cook until thick. Add nuts. Divide into thirds and roll out into a thick sheet. Place 1/3 of mixture in each sheet in a line and roll up. Slice into 1/4 inch cookies and bake for 10-12 minutes. 1. Preheat oven to 350°. Whisk flour, baking soda and powder and salt; set aside. Combine butter, sugar, brown sugar, eggs and vanilla with a hand mixer on low. To cream, increase speed to high and beat until fluffy and the color lightens. 2. Stir the flour mixture into the creamed mixture until no flour is visible. Over mixing develops the gluten, making a tough cookie.) Now add the oats and raisins; stir to incorporate. 3. Scoop about 2 tbsp of dough and drop 2-inches apart onto baking sheet sprayed with nonstick spray. Bake 11-23 minutes until golden but still moist. Remove from oven and let cool. Oh, I so wish I received a big box with all those wonderful goodies in it at Christmas! All the cookies look amazing. Thanks for sharing these 5 recipes. What a wonderful tribute to all grandmas in the world. Isn't it amazing how these recipes can remind us of family and home. My husband's family is huge too. It has been an adjustment for me! I hope you have a great Sunday. Thank you for sharing this sweetness!